Science? Only when it’s practical, please. When the idea of “science” is brought up, most people agree that this so-called science is a good thing. In fact, in a somewhat recent poll by the Pew Research Center, 84% of Americans surveyed believed the science in their lives to have a positive influence on society, with only 6% indicating the opposite. 70% said they believed scientists to have a positive influence on society, which is even more than doctors! While the magical idea of “what science is to me and not to you thank you very much” sounds preferable to your average consumer of science, the reality behind belief in American scientific progress is a bit more bleak. From the same poll, only 17% of those surveyed believed America to among the “best in the world” when it comes to scientific research, with 49% believing America to have the best scientists in the world. It’s a lot easier to deny an intangible idea, isn’t it? 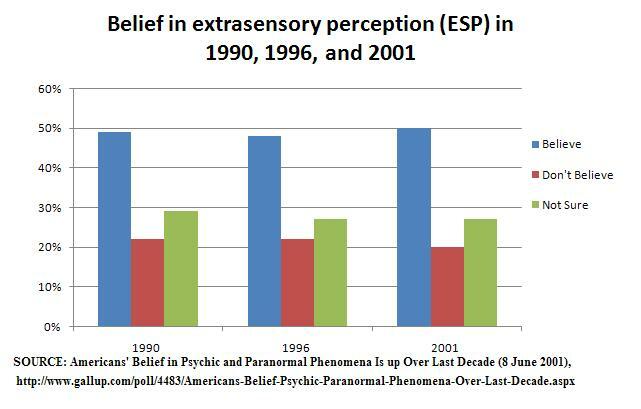 Three separate Gallup Polls taken between 1990 and 2001 measured public beliefs in various paranormal phenomena. Notably, and in spite of the 84% of Americans putting their faith in science, a large portion in all three time periods (50%) said they believed in Extrasensory Perception (ESP) , with only 21% definitively certain about its nonexistence. How do Americans, who are so sure of science’s contributions to society, have such a poor misunderstanding of such basic concepts? Principal researcher Heather Ridolfo’s recently published paper entitled “Social Influences on Paranormal Belief: Popular Versus Scientific Support” examined differences in perception of ESP based on both public and scientific opinion. What was found is that while people tend to evaluate the validity of claims based on how many other people support said claims (a cognitive bias known as the Bandwagon Effect), the support of the scientific community (or lack thereof) has no impact on evaluating the validity of claims made about ESP. From this, the researchers concluded that their finding “may reflect decreasing trust in the institution of science”. Whatever the reason, the romantic idea of science and the reality behind science have a long way to go before they meet.